You've found the “U.S. Blue Swedish Duck Breeders” page here at Hobby Farm Wisdom! If this is the first time you have visited our site: Welcome! The Blue Swedish ducks are a medium sized weighing between 6.5 to 8 lbs. They have an oval head, medium length bill, stocky build and has a semi horizontal stance. 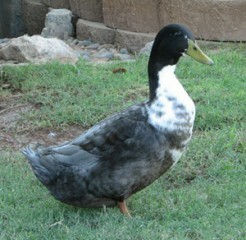 The standard color is a uniform bluish slate, with a white bib differing in that the drake’s head is dark blue with a greenish bill and the duck’s head and bill are the same blue slate color all over. Their legs are reddish-brown with dark markings and sometimes they have a few white feathers. The Swedish birds also come in Black, Silver and Splashed color patterns. They mature slowly but provide superior meat since they forage in orchards, paddocks, grass and other natural foods. They don’t thrive in confinement but are very cold hardy. This breed will produce around 100-150 white, green or blue eggs a year and they have calm dispositions which make them great to keep as pets.